There's No Time .... Like Sno Time! CLICK on the page tabs for more detailed info! Sno Time, LLC is an experienced concession food and treat operator. Offering affiliations with many name brand companies in the treat industry with a focus on ice and ice cream type products. Over the past 20+ years we have operated and supplied major theme parks and national attractions. We also have experience with mall & boardwalk locations, in-line & free standing stores, and mobile carts & trailers. If you’re looking to add products or increase revenues to your existing store or attraction we have many options and products available. TURN-KEY PACKAGES WITH NO CAPITAL INVESTMENT! For larger venues Sno Time, llc offers complete turn-key packages with no capital investment! We supply you with all required equipment and supplies! All you supply is the labor! Depending on your operations size, food costs can start below 19% including product, cup and spoon! Offering over 80 different premium flavors of Shakes, Smoothies, Slush and Shave Ice. Superior Ice Blended Coffee drinks! Exclusive Planet Ice Signature Items! FAST COW, CHERRY BOMB & FAST FREEZE ( Energy Drink products) CHILL-LOTTI, GALACTIC BLAST, MARS MUDDD, FROG N BLENDER, BAD APPLE & SHARK ATTACK! Using the Planet Ice Business Plan you will receive all the great benefits a franchise may offer without the hassles or additional costs associated with a franchise. FOR A QUICK REVIEW OF THE BENEFITS OF THE PLANET ICE BUSINESS MODEL PLEASE CLICK ON THE "PLANET ICE TAB" ON THE TOP LEFT OF THIS PAGE. 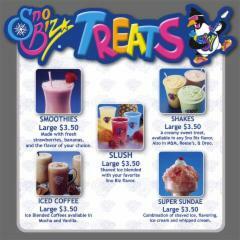 Travel to "Brain Freeze and Beyond"
THERE'S NO BIZ ... LIKE SNO BIZ! It's Time to Enjoy the SNO!